Stand Up for SINGAPORE: Tampines GRC MP made a mockery of himself. Member of Parliament (MP) for Tampines GRC, Baey Yam Keng is the man slated for the new ‘wayang’, after Teo Ho Pin and Grace Fu’s lame attempts at explaining/side-stepping the AIM-PAP saga was squarely shot down by netizens, point-by-point. 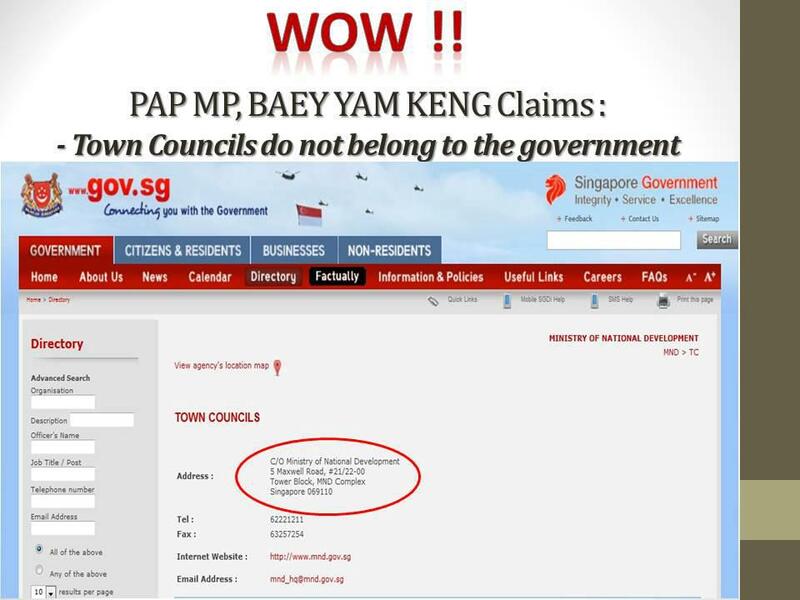 "TOWN COUNCILS ARE NOT PUBLIC INSTITUTIONS" ~ A claim which Mr Baey proudly made in his monthly FaceBook chat session on Sunday (6 January 2013). He said, “They’re not public institutions; they’re not a public service company”. He did acknowledge, however, that Town Councils do provide public service to residents. 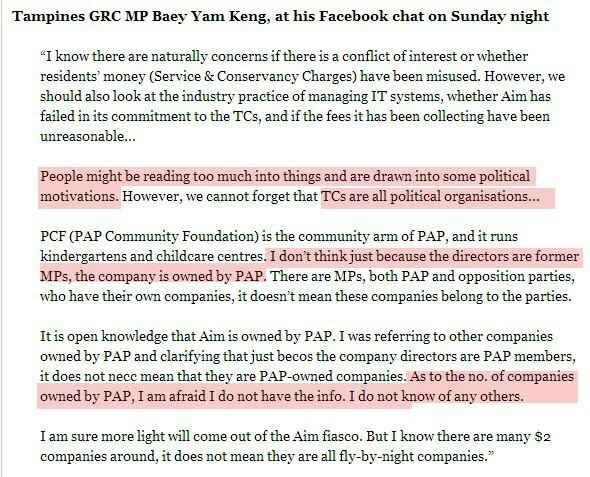 Mr Baey was replying to online questions posted by netizens on the recent AIM-PAP saga. He also felt that the matter had been unnecessarily “politicised”. “They do not belong to the government. They’re governed by government regulations, but they’re definitely not run by civil servants; and they’re not a public agency,” he later clarified with the media (see *note below). Netizens also asked Mr Baey whether the tender process was properly done and if there was a conflict of interest regarding the sale during the chat session. He sidestepped the questions and replied that the focus should instead be on whether AIM had failed in its commitment to the town councils and whether its fees have been unreasonable. 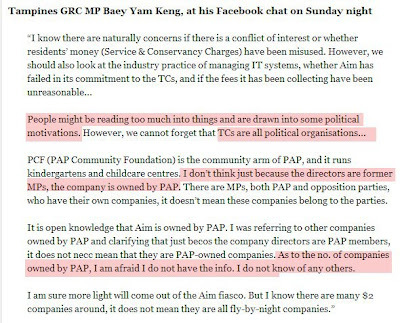 The fact that Mr Baey thinks town councils are not public institutions, he seems to be implying that it’s alright for political party-owned companies to transact with the town councils, which after all, in Mr Baey’s views, are political organisations from the same party. 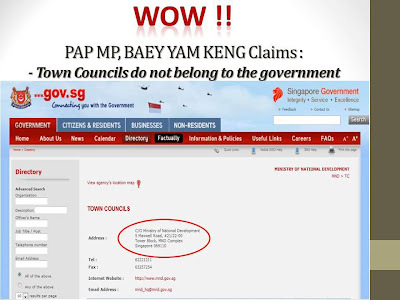 For the benefit of those who cannot understand the twisted logic, with this statement, Mr Baey has effectively closed the case on the AIM-PAP saga because Town Councils are NOT public institutions even though it provides public services. As such, since it is a PRIVATE institution owned by PAP, it is not dealing with public funds and is not answerable to the public on its dealings. Town Councils are therefore merely a PAP-controlled business entity at liberty to do business with whoever it wants, as long as it is legal. Going by this logic, S&C charges and other fees collected from residents belongs to the PAP (as owner) and are NOT public funds. So, in essence, when a resident pays S&C charges to town council, he is deemed to be making a political donation to the party controlling the town council?? And, since public funds are not involved, does it mean it’s none of Singaporeans’ business to dictate or know how it is being used?? Imagine if we apply Mr Baey’s latest ‘twisted logic’ to GIC and Temasek Holdings… Scary, is it not? The Tampinese GRC MP has made a mockery of himself. How could he say that TCs are all political organisations and he needs the public to tell him likewise! So Mr Baey, let this be a lesson to you and don't just mouth off without checking the facts. What a shame for a "high caliber, elite" PAP Member of Parliament! 50. All members, officers and employees of a Town Council shall be deemed to be public servants for the purposes of the Penal Code (Cap. 224).